Yahoo recently announced a partnership with Nectar for Consumer Connect, a program which aims to use offline purchase data to target online advertising more effectively. David Buckingham is Commercial Director at Loyalty Management Group, the company which runs the Nectar card scheme. I’ve been talking to David about how the scheme works, and how he hopes that it will convince more FMCG brands to advertise online. Can you tell me about Consumer Connect? It’s unique outside of the US, as it’s the first instance of using offline shopping behaviour to inform online ad targeting and post campaign evaluation. Basically, we are using consumer shopping data from Sainsburys, through Nectar cards, to target online advertising more effectively and will measure the subsequent effect of these ads on offline shopping behaviour. So the data will go from offline to online and then back again. It’s a project between Loyalty Management Group and Yahoo to create a joint panel of people who are engaged with both Nectar through Sainsbury’s, and Yahoo properties online. We have approximately 17m people that currently use Nectar cards, and we cross-referenced the heavy Nectar users in this database to find those with Yahoo email addresses, and who presumably use Yahoo services online. We found a high level of crossover, and this was the starting point for developing a panel. When we found a match, we emailed these customers to invite them to join the scheme. With consumer concerns about data privacy, we have been careful to be upfront about what we are doing with this scheme. We have been above board with consumers, describing what the scheme is about, why we have contacted them, and how their purchase data will be used to target advertising. We also rewarded these customers with additional Nectar points, and we contact them every quarter to remind them about the scheme, make sure they are happy to stay on. Those who chose to stay on were also rewarded with more Nectar points, so customers have an incentive to stay involved. How many customers are on the panel? We have created a panel which is expanding all the time, and there are currently around 30,000 people opted into it. And you’re targeting FMCG brands? We’re targeting FMCG brand owners and their agencies, and have started by running a campaign for Cadbury’s Crème Egg. They provided us with a set of campaign objectives and the kinds of customers they wanted to target. From the offline purchase data we have, we were able to segment these groups e.g. people who buy confectionary on a regular basis, or we can even be more specific if necessary, such as segmenting people who buy Kit Kats but not Creme Eggs, and so on. So, we arrive at a segmented group, one which also has also demonstrated active behaviour across Yahoo sites. We then have a third party which looks at this segment, and based on their online behaviour, they search the rest of the Yahoo database for ‘lookalikes’ that display the same kinds of online behaviour as those Nectar card users we have selected. Thus the original segment is multiplied by hundreds to find a target audience of something like 1-2m web users to target. These are deemed to be indicative of the type of shopper Cadburys is looking to reach and over a five to six week period, they are served up ads for Crème Eggs over Yahoo’s sites. The idea is that, thanks to the offline data, the advertiser gets a much better hit than they would otherwise have done as they are providing more relevant advertising. We can measure the success of these campaigns by looking at click through rates, and then, post-campaign, we will get some feedback from Yahoo. We can then look offline at the subsequent purchase behaviour in Sainsbury’s from the segmented group that has been exposed to the Creme Egg ads to determine any uplift in sales, and an ROI figure for the campaign. There is also a control group that has not been served up ads for Creme Eggs, and the offline purchase behaviour of the two groups can be compared. We are currently waiting for the results of the first campaign and will release these when we have them. This kind of targeting has been used in the US for sometime with similar retailers, and they have seen some fantastic levels of uplift in sales, so we are confident that the results will be positive. We will run a few test campaigns to show the potential results of these campaigns, and then we plan to roll this out to a large FMCG audience, with a premium price positioning since it is much more targeted. There is a closed loop element to it, and the value it can provide for brands is provable. Why have FMCG brands been slow to advertise online? Will this kind of scheme convince them? These brands have been reluctant to get online, as they feel it is easier to prove ROI for offline campaigns, but there is a way of measuring online campaigns, so when they see provable results, I think many will be convinced. Is Sainsbury’s making more of the Nectar data now, as Tesco does with its Clubcard? Absolutely, one of the things we do more now is to use customers purchase history to deliver relevant offers. Does the ability to share information between its retail partners give Nectar a potential edge over Tesco’s Clubcard? We think it is a stronger scheme as it offers more to customers thanks to the range of retailers that offer Nectar points. This enables customers to earn perks more quickly. For retailers, it can be a useful acquisition tool, as it gives them access to the data from 17m Nectar card users. 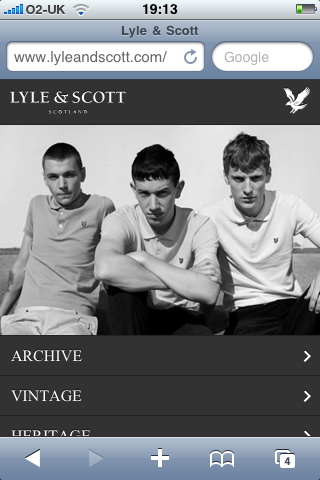 Fashion retailer Lyle & Scott launched its first mobile commerce site last week. With so many retailers launching iPhone apps, it’s refreshing that one has decided to move into mobile commerce with a website.